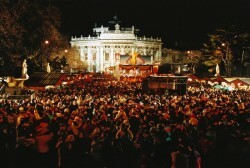 What to Do in Vienna at New Year's Eve? New Year’s Eve in Vienna without music and dancing? No way! Whether Musikverein, Konzerthaus, Theater an der Wien or Kammeroper: Musical delights will be everywhere guaranteed.